I want to talk about photo backups again, because they're important. In these digital days, often the only copy of a photo you have is sitting on your hard drive... and that's not good. Back in the print days, at least you had negatives to back up your prints. I'm talking about photo backups here, but this applies to any file you consider important, including videos, documents, emails, etc. Backing your photos up to an external hard drive is good but that is only 2 copies, on one type of media, and no offsite backup. Offsite backup is important. What if you have a fire or a theft? Your computer and the external hard drive beside it (or in the same bag) are both toast and then you have nothing. So I have three copies, on one media type (hard drives), with one offsite copy. Personally I don't think two media types are really that important, and the convenience of online hard drives trumps the inconvenience of shuffling DVDs. I have 510 GB of photos at the moment - that's a lot of DVDs. This could be improved. I really should make a copy of the photos to some kind of removable drive immediately after step 2, because often the photos live on my laptop's hard drive for days before I get around to processing them. Bittorrent Sync is fantastic for this application. I just move the photos to their permanent location on my desktop, and they are automatically copied offsite within minutes. 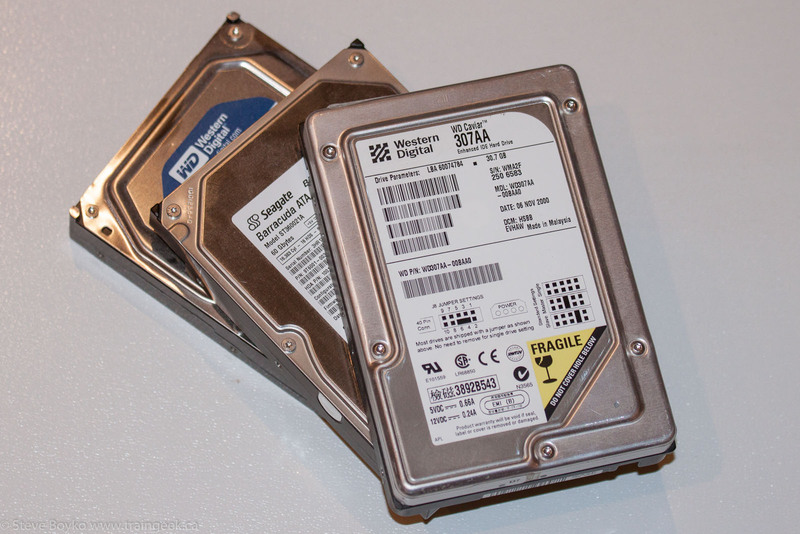 You could use a cloud backup service like Dropbox or Crashplan. I use Dropbox for sharing files between computers but there's not enough space there for all of my files. I also don't trust cloud backups with my data, but that's a different story. I use a different method to copy to my home server because I want to be protected against accidental deletion. RoboCopy adds the files to my home server but never deletes, so if I accidentally delete a file from my permanent location, it will still be on my home server. When I do the copy to the home server, I get a log file in my Dropbox and I check it to make sure there aren't any "extra" files on my home server that aren't on my desktop. To recap: After my spiritual moment at Mortlach, Saskatchewan, I went to Parkbeg only to find the elevator gone. A little crestfallen, I returned to Mortlach to capture a few more trains before my time was up in the morning of July 14th. The next train was a westbound led by CP 9621. Since it was still fairly early in the morning, I was shooting against the sun and I didn't expect a really good shot. After some heavy processing, this is about the best that I can do with it. I sat in the shade in my van and read a book while I waited. Mortlach is quite a peaceful place and I enjoyed listening to the bird sounds. I was playing around with the circular polarizer filter on my camera. I want to show you the difference that it makes. 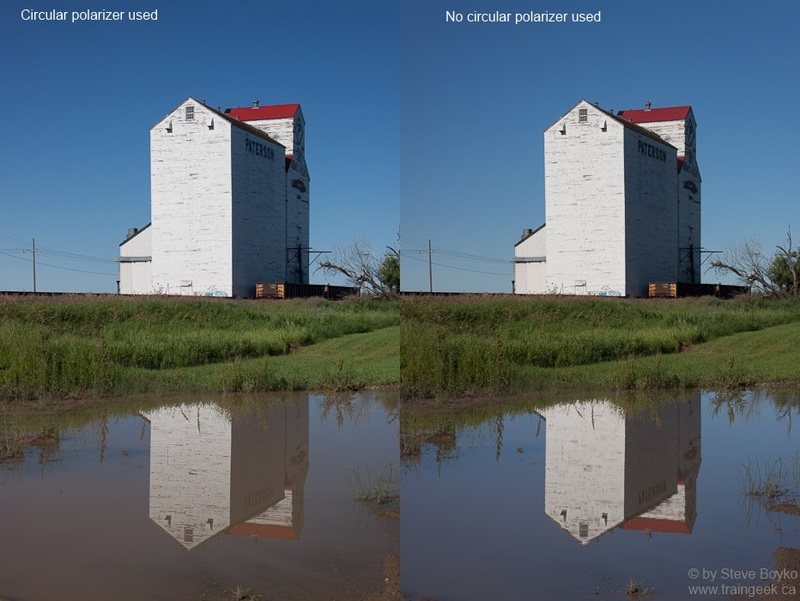 Remember that a circular polarizer removes polarized light. It has the effect of darkening skies, removes glare, and saturates colours. I like putting it on my lens in bright, sunny days to make a bluer sky. Some people forget about the glare part, but I want to show you the difference it makes for reflections off water too. Here are two shots of the pond, taken a minute apart, one with the polarizer and one without. See the difference? The polarizer cuts the glare down and allows you to "see" into the water. In this case it is a bit undesirable as you can see how shallow the pond was and the mud colour shows through. In other cases you might want to see the bottom of the water and a polarizer will help. The reason why the mud didn't show in the earlier photo is because the sun was lower and didn't penetrate the water as well. Anyway, back to trains. The third train I saw at Mortlach was CP 8641, heading east. I decided to take a vertical shot for variety. I did do a landscape shot too. I didn't take video here, because the batteries in my Canon S3 had already died. Oh well. After that train passed, I headed back toward Pense. As I passed Belle Plaine, I saw a train headed by CP 8879, CP 6029 and CP 3030 heading east as well. Fortunately they slowed and came to a stop, so I stopped on the opposite side of the highway and took some photos from afar. The crew of CP 8879 dismounted to do the rollby inspection. Here's the meet with CP 9616.